Mongolia is large and sparsely populated country, with nomadic traditions, but rapidly modernizing. As in any modern country, there is an important role for data to play in planning and development, and Mongolian data professionals are developing themselves to meet the challenge. Last year in May 2017, Ryan Womack (currently serving as IASSIST Secretary) was invited to give a two-day workshop on Topics in Data Science at the National Statistics Office of Mongolia. There were 33 attendees from the NSO and a cross-section of Mongolian government agencies focusing on data. IASSIST generously provided sponsorship to cover the cost of participants' lunches during the event, which were held at the delightful "Modern Nomads" restaurant, serving traditional Mongolian cuisine. While the workshop participants were refreshed by the meals, this event also gave the opportunity to familiarize a group of Mongolian data professionals with the work of IASSIST. A key organizer of the event on the Mongolian side was Ch. Davaasuren, Research and Development Director of the Mongolian Marketing Consulting Group [pictured at the left in the video above]. His assistance was invaluable in arranging all of the contacts, schedules, meals, translations, and other details of the visit. His expertise and concern for data issues was also evident throughout. MMCG is the leading survey research organization in Mongolia and conducts surveys for international business, NGOs, and nonprofit organizations on marketing, social, and political topics. 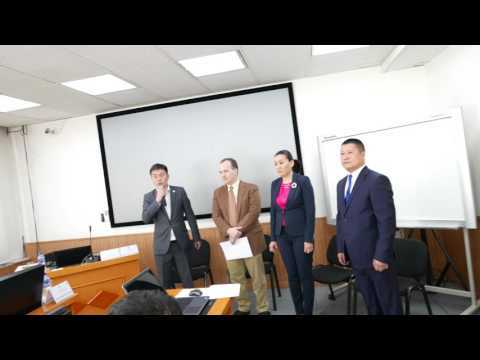 The visit to Mongolia also included talks by Ryan Womack at the National University of Mongolia, the Mongolian University of Life Sciences, and the Mongolian University of Science and Technology. This provided an opportunity to meet with academics working with data and statistics in Mongolia, and another chance to introduce the Mongolian data community to IASSIST. Further details and photos from that visit are here. Flash forward to this year. Ch. Davaasuren maintained his interest in IASSIST that had begun from the prior year's meeting. Ch. Davaasuren applied for and was selected as an IASSIST Fellow, and will attend IASSIST/CARTO 2018 in Montréal. Davaasuren's most recent conference experience was as the lead organizer for the first Asia Pacific Research Committee conference ever to be held in Mongolia. APRC is focused on developing market research methodology in the Asia-Pacific region, and may be a useful partner in extending IASSIST's outreach in Asia. Davaasuren is also Chair of the Mongolian Marketing Research Association. Ryan Womack has also continued his interest in Mongolia, and was invited to teach a one-week Short Course on Multivariate Statistical Methods with R at the Mongolian University of Life Sciences in February. That visit is profiled, with photos, here. Continued discussions with the Mongolian University of Life Sciences and the National Statistics Office of Mongolia promise further collaborations in the future. With Davaasuren coming to Montréal, it will be a chance to meet with other IASSISTers and hopefully to broaden the base of Mongolian connections to IASSIST, and vice versa, further internationalizing our organization. IASSIST event sponsorships and the IASSIST Fellows Program can catalyze that process.